SmithWorks Outdoors delivers ultimate outdoor products that guarantee well thought out design, quality construction and uncompromised value for discriminating outdoorsmen. SmithWorks Outdoors is the vision of Dave Smith. Dave retired from owning a successful Security Company in Burnsville, Minnesota for 38 years. 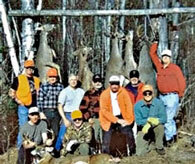 And although he loved the business environment, his true passion was spending time in the North Woods of Minnesota where he and his hunting partners have hunted deer for more than 40 years. In 2006, after Dave and his hunting companions had tried dozens of ladder stands, climbing stands, ground blinds and tree seats of all makes and models, the need for a new hunting blind design became clear. The vision of the ComfortQuest Hunting Blind began and was translated into the first computerized drawings. After the purchase of an industrial sewing machine, the first ComfortQuest Hunting Blind prototype took shape. In 2007, Dave produced 15 more prototypes. 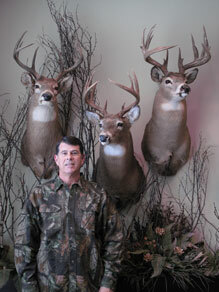 He and his hunting partners tested the prototypes for three hunting seasons. Dave listened to the experienced hunters, implemented their suggestions and finalized the design of the ComfortQuest Hunting Blind. In 2010, hunters requested larger blinds, so SmithWorks Outdoors designed and manufactured the larger 4x6 ComfortQuest Blind. It has the same great features as the earlier 4x4 ComfortQuest Blind (aluminum frame, 600 denier water resistant polyester fabric blind and carry bag) only mounts on a 4x6 platform. Hunters also asked for a chair that was comfortable, light-weight and could be transported easily to their hunting spot, thus the introduction of the ComfortQuest SPORT Chair, the first comfortable, lightweight, packable swivel arm chair. We added the "Big Boy" Chair to accomodate robust hunters to 450 lbs along with Optional Turkey Legs for both the SPORT and "BIG BOY" Chairs to provide low profile seating 8 to 10 inches off the ground. SmithWorks Outdoors is dedicated to offering only superior hunting products that Dave and his hunting group approve of and use themselves. We are adding accessories to enhance the main ComfortQuest Hunting Blind package. So far, these accessories include a Mesh Screen Package, a Window Package and a Hook and Shelf Package, a 5-LED remote controlled Light, a Blind Mat and a blaze orange Safety Wrap. Look for more products to be added in the coming seasons. SmithWorks Outdoors has a true commitment to manufacturing quality products that hunters love to use at a price all hunters can afford. "I have personally used the ComfortQuest Hunting Blind in the field for several hundred hours. I love it and I know you will too. I know it will allow you to enjoy your sport in comfort! 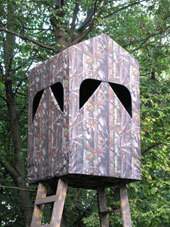 I look forward to hearing about your successful hunt using the ComfortQuest Hunting Blind!"